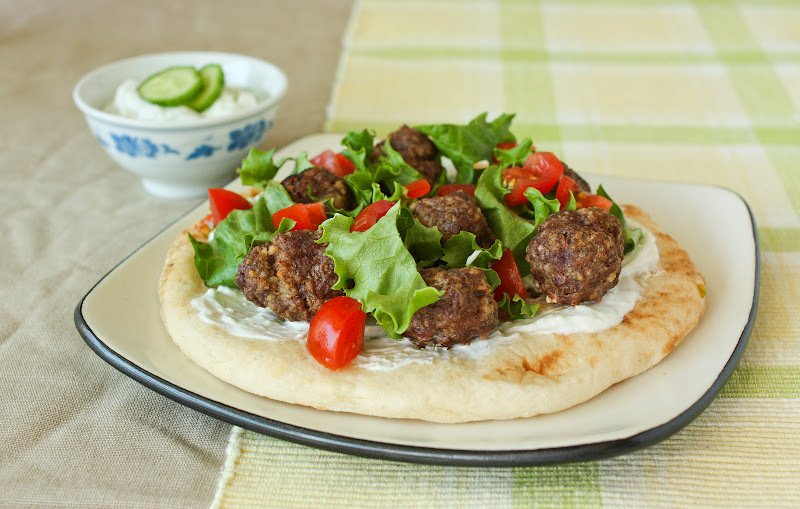 Want something quick, easy and different to make for dinner? 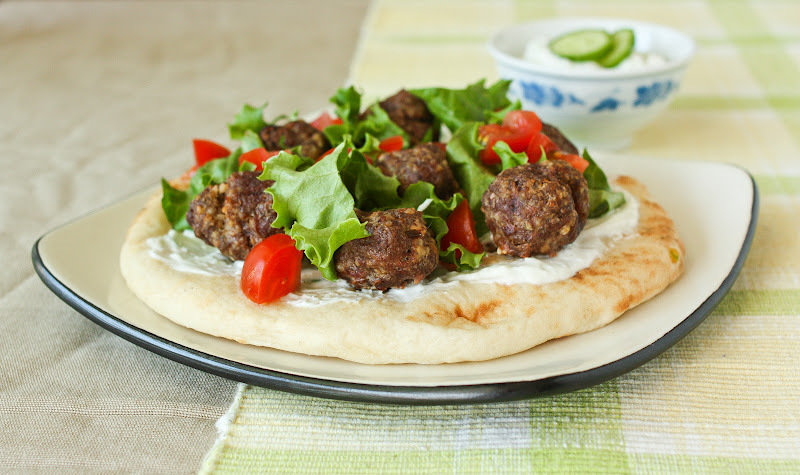 Make these awesome meatball souvlaki pitas. You can have these on the table in under 30 minutes - can't beat that on a week night. Plus, these will help you get out of that rut of having the same old week night meals. Your family will thank you! Line a rimmed baking sheet with foil, spray foil with nonstick cooking spray. Set aside. In a bowl, whisk egg. Whisk in the crouton crumbs, mustard, oregano, salt and pepper. Mix in beef. Roll into 1 tbsp balls - makes approximately 24 meatballs). Place on a prepared pan. Bake in 450F oven for approximately 18 minutes or until cooked through. In a bowl, combine yogurt, cucumber, garlic, mint, dill, salt and pepper. Spread pitas with a layer of hummus. Then spread a layer of the yogurt mixture over pitas. Sprinkle with lettuce. Divide tomatoes, onion, then meatballs. 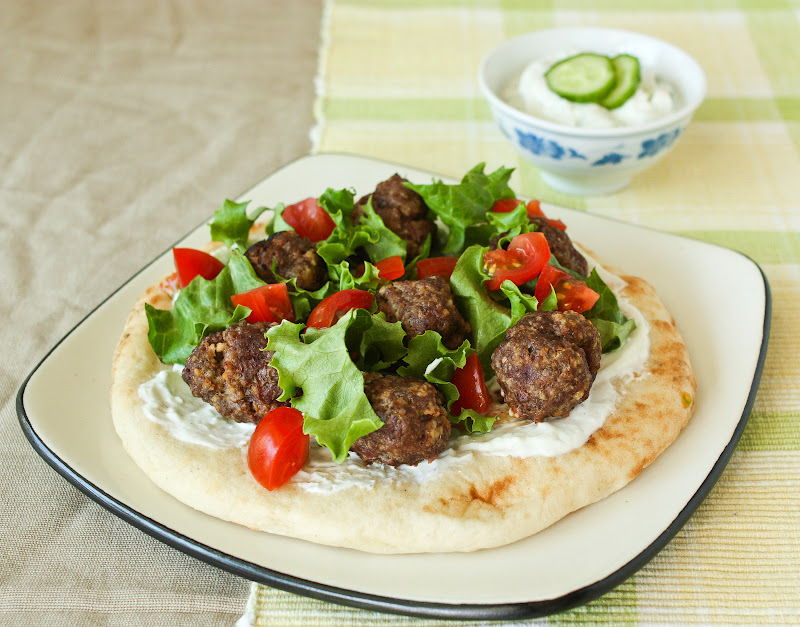 Fold each pita in half to eat. Enjoy! Serves 4. 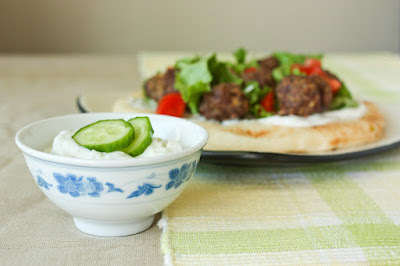 This post has been linked up with Fusion Fridays Link Party over at Jennifer Cooks. Head on over and check out what other fabulous dishes the blogosphere has whipped up this week.